Home » News & Events » Blog » Contractor Channel » Is Rebranding Worth the Investment? As your company or association grows or the market evolves, revisiting your brand vision and core values and the market’s perception may be necessary. Regardless of industry, this introspective look at who you are as an organization is a significant investment in time and resources. When ROI matters, is this investment justifiable? Every organization must answer that question for themselves based on the return they expect. However, the experiences of those who have done it can help. Market Connections talked with Cheryl Sadowski, Senior Director of Communications, Publications and Marketing for the Society of Interventional Radiology (SIR). In 2013, SIR leadership made a strategic decision to revisit the brand of the society. Cheryl and an integrated team led the project from inception through launch over a period of two and a half years. Today the SIR brand permeates everything from media outreach through partnerships to human resource practices. Cheryl spoke with us about the motivations behind the brand refresh, SIR’s process, and the ROI. MC: What was the impetus for rebranding SIR? Cheryl: In 2012, executive council (SIR’s version of a board of directors) created a five-year strategic plan toward a new envisioned future for the society. 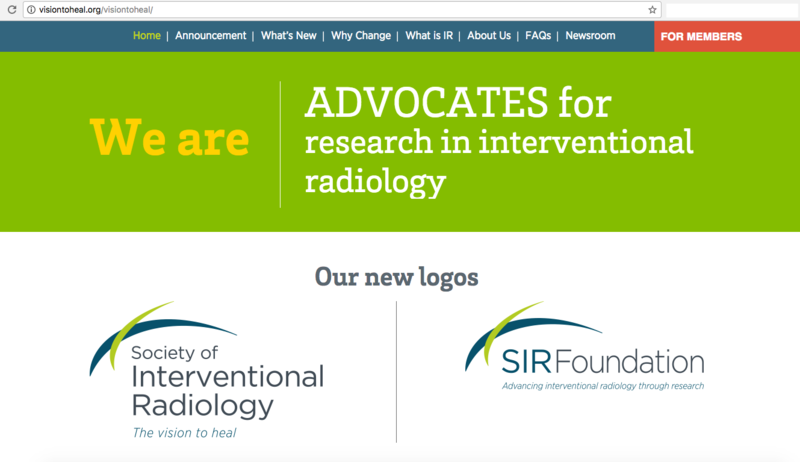 That process provided an opportunity to take a fresh look at where interventional radiology (IR) stood in the overall healthcare landscape and to clarify our brand. The brand assessment was very comprehensive and identified perceptions of IR among the various audiences that matter to our specialty and society — it included our members, policy influencers, industry supporters, and patients. MC: What changed in the market to make this clarification important? Therefore, the brand clarification was a first major step toward addressing our long-term vision for IR: to be the first choice in image-guided medicine. Our executive council was supportive of the entire process. MC: There are many ways to approach a rebranding like this. How did SIR choose to do it? Cheryl: I know many organizations would probably use one agency to do it all, but we decided to work with a different agency for each piece. We divided it up into three chunks: brand clarification, visual identity, and roll-out, and we worked with partners that excelled in each piece. MC: That is interesting. How did it work out? Cheryl: I rather liked having a variety of perspectives on our brand and treating each increment as its own independent effort — even though each phase was very much linked to the next, and there were some points where all three agencies were talking to one another. Each firm brought something valuable to the brand and that gave us confidence in a well-rounded result. It was the right choice for our society and what we wanted to accomplish. A microsite was a key piece of rolling out the new SIR brand. MC: So, starting with the first phase, how did the process work? Cheryl: For the brand assessment, we worked with the Washington D.C. nonprofit/healthcare division of Porter Novelli, a public relations firm in Washington D.C. They did the market perception research and created our brand messaging, positioning, and pillars. As a small nonprofit, we didn’t have the budget to do a national, full-scale market study, so we focused on conducting focus groups among key stakeholder groups. We wanted to uncover the opinions and insights of the audiences that are important to IR’s success. Internal stakeholders included SIR members (both active and less active), trainees (members who are not yet practicing physicians), and corporate supporters. We also reached out to patients and policymakers. Our goal was to look at what these different audiences were saying and to zero in on some of the key patterns and perceptions we needed to either better understand, or change, if the effort was going to truly going make a difference. Porter Novelli guided us through this organizational “soul searching”— a deep internal look at how we talk about ourselves, what we stand for, what we believe about IR, what it can do for the world, and how that all matched up against the perceptions of our key audiences. The brand framework arose from recognition of the patterns and the variables. Cheryl: Then it was time to create the visuals to accompany it — always a fun part! SIR chose to work with a Northern Virginia graphic design agency Apertures on this important and very visible phase. But this was about much more than refreshing a logo, although that was part of it. We also developed a new tag line that is more representative of what IR stands for, we developed a new color and font palette to guide all our marketing collateral, and (just this year) the visual look of our new website. Once we had brand framework in place and the supporting visual identity, it was time to introduce it to our members and the public. For this, we hired the The Reis Group (formerly GYMR), a D.C. public relations agency that specializes in health and sciences. They really helped us to launch our new presence in a methodical and meaningful way, and they continue to represent SIR. MC: What did the rollout include? Cheryl: We launched the brand via a dedicated microsite based on our tag line: visiontoheal.org. It explains the brand, the reasons behind the refresh, the new visual identity, and includes an FAQ section, as well as a protected section for members only. The microsite was our primary means for sharing and answering questions. We rolled the brand out concentrically, first through our leadership, then other key stakeholder groups in the society, and then moving outward and onward to the general membership and other audiences from there. MC: The question most people have when they are embarking on something like this is the investment. Can you share that with us? Cheryl: At SIR, marketing budgets spread throughout different areas of the organization, so I can’t speak about the investment in those terms. But the total integrated effort from inception to launch was less than a percent of SIR’s overall operating budget over several years—a modest investment, wisely allocated, that has afforded tremendous return in organizational clarity, member and staff morale, and increasingly, awareness. I think it’s inaccurate to frame of any type of branding effort as a ‘one-and-done’ cost. Supporting the brand through communications, public relations, and continued enhancements to our visual identity is an ongoing portion of our budget, and though SIR is a small nonprofit, we are committed to ensuring there are reasonable dollars allocated to each of these elements. MC: What about the ROI? Cheryl: It is always challenging to map the results of a branding project directly back to financial ROI. What I can tell you is the year following the brand launch (2016) was the strongest financial position the society has seen in a decade. 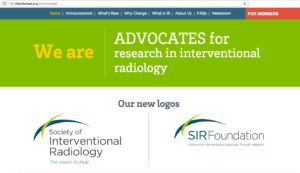 SIR is realizing more funds to reinvest in the work and programs that support our mission through continuing medical education, advocacy, grants, scholarships, and research. The society has more trainees attending its annual scientific meeting than ever before, more medical students are expressing an interest in interventional radiology, and volunteer engagement is growing. Our membership is the highest it’s ever been and our social media audiences have grown— 37% on Twitter, 23% on Facebook, and 33% on LinkedIn. While there is clearly some monetary ROI, what all of this tells me is the society’s vision for itself and for IR—and the way we are expressing that vision—is resonating with our members. We’re seeing it in the energy level, excitement, and productivity of the overall organization. MC: What’s one piece of advice you would definitely give a company considering a brand assessment/clarification? Cheryl: Be authentic. Where we are today, is not a result of a brand that was ‘put upon’ the organization by the communications department, rather a more visible manifestation of what was already there…simmering below the surface. We talked with the people who make this society possible and uncovered from them what they’re most excited about, what motivates them about the specialty, why they think it’s unique, and how they want their society to represent them. A successful brand is not invented by consultants, but excavated from the vision and energy of the people who are invested in the organization. For SIR, that means our executive council, members, volunteers, and staff. If they didn’t feel this whole effort was an accurate, authentic manifestation of what they believe in, there wouldn’t be a brand. Everything we say and do as a society is a reflection of the passion of our members and stakeholders. That is powerful. Market Connections would like to thank Cheryl for taking the time to share her experience.